' ' Cinema Romantico: What Wrong Best Picture Joke Will Jimmy Kimmel Make at the Oscars? What Wrong Best Picture Joke Will Jimmy Kimmel Make at the Oscars? When last we left off, Jimmy Kimmel was standing onstage at the Dolby Theater apologizing and trying to place the blame on himself for the envelope fiasco that briefly found “La La Land” named as winner of the Best Picture Academy Award before it was revealed that, no, presenters Warren Beatty and Faye Dunaway had the wrong envelope and the real Best Picture winner was “Moonlight.” Even now it’s a little hard to wrap your mind around any of this actually happening, but trying to place it into proper context one year later is not what Kimmel, reprising his role this coming Sunday as Oscar host, was hired to do. No, he was hired to make jokes. 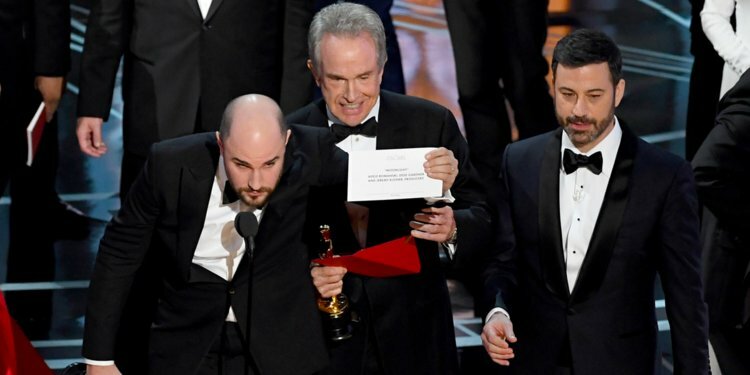 And the surest thing in show business in 2018 is that Jimmy Kimmel will make a joke about the envelope fiasco at the Academy Awards. The question then becomes: what joke will he make? So, I convened my think tank, and on the strength of myself and my friends Brad, Daryl, and Jay, we have settled on several tantalizing possibilities.